1979 brought a new genre of rock into the limelight, Southern Rock. The roots of this country boogie style meets heavy rock go back to the early seventies with the band many officianadoes credit as the creators of southern rock, The Allman Brothers. Their blues based southern sound was unique at the time and would be a mainstay throughout the seventies. The cause of southern rock was further pioneered later in the decade by the great Lynyrd Skynyrd who brought a more harder edge to it. For a teenager like me who lived in the North, Skynyrd was one band from the South you could listen to and not only rock out, you wouldn’t be looked upon as some kind of redneck, although a lot of young rockers who were labelled such were into them too. 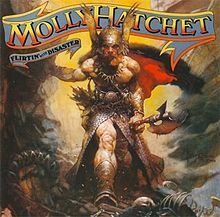 Okay, enough of the history lesson, (I’m sorry, it’s the teacher in me again) on to 1979 and this fantastic album from Molly Hatchet. It was this album that thrust them into the light and make the entire rock world at the time stand up and take notice of them. They had a much harder sound than even Skynyrd and even the more slower songs like “Long Time” have a rockier edge that make you want to stand up and go “Yeah!” with a raised fist and a can of Budweiser in the other hand. When you listen to “Flirtin With Disaster” you are in no doubt that you are listening to a true hard rock album. For me, the album was the thrash metal of 1979. Yes I know it doesn’t come anywhere near thrash but with the exception of maybe Van Halen, AC/DC or Ted Nugent, there was nothing heavier. I can say that “Flirtin With Disaster” completely sealed my cross over into hard rock and metal forever. When I heard this album, there was no going back. The great thing about it is that although it’s a classic hard rock album, many of the songs still contain that southern boogie vibe originally began by The Allman Brothers and Lynyrd Skynyrd. Take the song “Jukin City” as an example. Hard guitars start the song and set a rhythm that is so catchy, it stays in your head long after you have head banged your way through its entirety. The same can be said about the other songs on the album and especially the title track. In each and every one you are greeted by some hard but strangely melodic guitar sound that makes you just want to rock out! That said, there is not enough credit given to the guitar combination of Roland, Hlubeck and Holland. Sure other bands have three guitarists, but none that work so well together as the forementioned three. I practically love every guitar solo on the album. I sincerely believe that if Molly Hatchet had never been around (yes that would have been tragic) I am convinced that some heavy metal band in the 80s would have taken the name. The name alone indicates a heavy rock or metal band and was reason why I had to listen to the album. Furthermore, back in 79, the Frank Franzetta paintings which adorned the covers of this and other Hatchet albums inspired many bands long after in their album cover choices. So, why Molly Hatchet deserves all the credit for getting Southern Rock noticed by the masses, it should also be given the credit for its influence on the 80s metal scene after. This album is without a doubt their best one and one of my favourites of all time. This entry was posted on September 13, 2012 at 10:02 am and is filed under 1979, Heavy Metal, Music, Rock, Uncategorized with tags Americans, Classic Rock, Flirtin With Disaster, hard rock, Heavy Metal, Heavy Rock, Lynyrd Skynyrd, Molly Hatchet, Southern Rock, The 1970s, The Allman Brothers. You can follow any responses to this entry through the RSS 2.0 feed. You can leave a response, or trackback from your own site. That is a good album and I will be visiting that one when I hit 1985.